When the leaders and members of churches are confronted with the topic of what is the exact moment that one is saved, then there is a list of differing and contradicting beliefs. Many churches believe that one is saved at first belief, and then some may believe at confession of sins or confession of Christ or accepting Christ into one’s heart. Some say when a believer accepts Christ’s grace, says the “sinner’s prayer”, repents, joins a church, “Holy Spirit baptism,” water baptism, “speaking in tongues,” an anointing, or a preacher’s prayer before a congregation. Some believe that any such experiences is when someone could become saved and that salvation depends on the individual. Should there be so many contradicting beliefs? Ephesians 2:4–7 depicts an actual moment when Christ saves believers. Make a mental note now and think about when did you believe that Christ saved you. Consider some Scriptures and confirm or reconsider at what exact moment that Christ saves. The Gospel is the power of God unto salvation to every one who believes (Rom 1:16), and the Holy Spirit seals believers of the Gospel (Eph 1:13). Salvation is through faith (Acts 15:11; Eph 2:8; 2 Tim 3:15), and those justified by faith are justified by Christ’s blood (Rom 5:1, 9). This faith is not only a belief in Jesus, but also a belief in Jesus’ raising from the dead (Rom 10:9). In John 3:16, Jesus affirmed that whoever believes in Him “should not perish, but have eternal life.” Looking at John 3:16, the phrase “should not perish” is translated from one word in the subjunctive mood, which is conditional. This means that salvation is dependent upon other factors than belief alone. Translators could translate “should not perish” as “may not perish”. Faith is certainly essential and necessary for salvation, but Jesus saves those who obey Him (Heb 5:9). True faith is one consisting of works for faith without works is dead (Jas 2:17, 26). Even the demons believed and yet they are condemned (Jas 2:19). Man is justified by works and not by faith only (Jas 2:24). Works are essential to the faith by which Christ saves believers. In Acts 16:30–34 when the Philippian jailer asked Paul and Silas, “what must I do to be saved?”, Paul and Silas said, “Believe on the Lord Jesus, and you shall be saved, you and your household.” Would the jailer’s personal belief save his family who did not believe at that point? After the jailer’s household heard the Word, their immediate response was to be baptized that hour. The jailer is told that he and his household should believe, and they responded to the Word by being baptized. 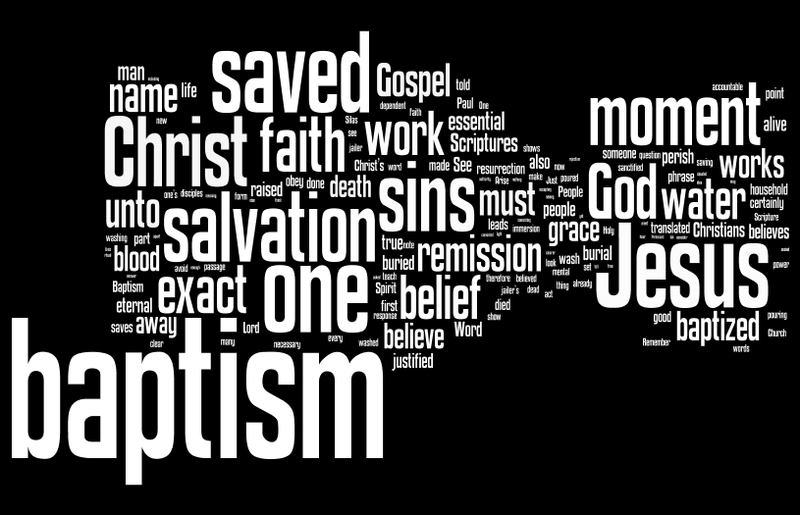 Evidently, it appears that the Word must have consisted of the act of baptism as a work of faith. This is certainly true throughout Scripture that baptism is a part of the Gospel of Christ. People are to obey the Gospel to be saved, and the Gospel is the death, burial, and resurrection of Jesus Christ (2 Thess 1:7–9; cf. 1 Cor 15:1–4). Baptism is a burial into the death of Christ (Rom 6:3–6, Col 2:12–13). Baptism is an essential part of the Gospel. Because believers are not saved of their own works but by the works of God in grace through faith, then baptism is a work from God and not from man. Jesus did tell His disciples that “Whoever believes and is baptized shall be saved” (Mark 16:16). Again, faith includes baptism, because faith includes the Gospel of the death, burial, and resurrection of Jesus Christ. Baptism does not omit belief or grace at all, but baptism is a part of belief unto grace. In Christ’s authority, Jesus told the Apostles, “Go you therefore, and make disciples of all the nations, baptizing them into the name of the Father, and of the Son, and of the Holy Spirit” (Matt 28:19). Jesus would not command a meaningless ritual that would hinder and, or take away from His Gospel — the power of God unto salvation (Rom 1:16). Now, nothing can be so apparent as 1 Peter 3:21 that shows the necessity of water baptism. Peter wrote that “now baptism saves you,” which is water baptism (1 Pet 3:20). Knowing that salvation is “not of yourselves” (Eph 2:8) and that “baptism saves” (1 Pet 3:21), then baptism is not included among these works of the Law of Moses mentioned in Ephesians 2:8–9. Baptism like faith is a work of God to which people must submit. Is baptism the exact of moment of salvation? Ananias told Paul, “Arise and be baptized and wash away your sins, calling on the name of the Lord” (Acts 22:16). According to this passage, baptism is the exact moment of salvation for at that point sins are washed away. This is not the only passage. In Acts 2:38, Peter proclaimed, “be baptized everyone of you in the name of Jesus Christ unto the remission of your sins.” Baptism in the name of Jesus Christ is water baptism (Acts 10:47–48). “In the name of Jesus Christ,” one is “washed,” “sanctified,” and “justified” in the Spirit of God (1 Cor 6:11), so it makes sense that baptism in the name of Jesus Christ is “unto the remission of sins.” “Unto the remission of sins” in Acts 2:38 is the same phrase that Christ used in Matthew 26:28, “this is My blood of the covenant, which is poured out for many unto remission of sins.” Jesus’s blood was not poured out “because of the remission of sins” that people already had, but Jesus’s blood and baptism are “unto the remission of sins,” so that at the exact moment of the pouring of His blood, believers are saved. In the New Testament Scriptures, baptism in the name of Jesus Christ was neither accomplished in response to salvation in Scripture nor was it an outward showing of an inward grace. Baptism was and is the exact of moment of salvation, because baptism in the name of Jesus Christ is not “because of the remission of sins,” but “unto the remission of sins” at that exact moment of immersion. This baptism is the one baptism of Ephesians 4:5, which is the water baptism of Jesus in which Christ sanctified and cleansed His church by the washing of water with the Word (Eph 5:26). This water baptism is not the same and is set apart from John’s water baptism of repentance (Acts 19:1–5). Baptism in Jesus’s name is for all repentant believers to submit to have the blood of Jesus wash away sins. Let not this work cloud with previous ideas and the word-wrangling of false teachers. Christ’s baptism is one of immersion in water not pouring or sprinkling (Acts 8:36). Baptism is for believers and not for children who are not accountable (Mark 16:16; Matt 19:14; Rom 2:12; 4:15; 7:9). Remember that Christians are saved by the Gospel (Rom 1:16; 1 Cor 15:1–2). People must obey this Gospel to avoid the just vengeance of God and to avoid suffering the punishment of eternal destruction from the face of the Lord (2 Thess 1:7–9). People are made alive at the same moment that Christ rose alive from His tomb. Likewise, in obeying the Gospel — the death, the burial, and the resurrection in Romans 6 — people are made alive rising from their watery graves in this spiritual burial. “We were buried therefore with Him by baptism into death. […] For one who has died has been set free from sin” (Rom 6:4, 7). See those who already believe and have died to their sins must be buried in the waters of baptism to rise alive from sin’s death (Rom 6:22–23). One is not saved that person believes and has died to sins unless that believer is buried with Christ unto death and is raised into the new life. Then, they are saved (Rom 6:4–5). This is also as Colossians 2:12 and 13 teach that one is buried with Christ in baptism and then Christians are raised through faith in the working of God thus making one alive (salvation) with Him, and at that exact moment, forgiving all one’s trespasses at baptism. Remember your previous mental note. At what moment did you believe that you were saved? If you have not been baptized for remission of sins and for salvation as the Scriptures teach, then “Arise, and be baptized, and wash away your sins” (Acts 22:16). Appeal to God for a good conscience (1 Pet 3:21). Salvation is not permanent and unconditional after baptism. One must live the new life starting from baptism. One must walk in the light for the blood of Jesus to continue washing one’s sins away (1 John 1:7, 9). I hope grace and peace in Christ Jesus to all who read this. You offer nothing new to the conversation. Just the same old heresies. My comments to Tim alone before have answered your statements. Have you read them? You are just saying the same things over and over again. If you would comment on what has been said and show what things are assumptions, then I’ll allow your comments, but we don’t need any more assertions. Write your rebuttal on your blog. This is what should be at the beginning of my comment. If I am so wrong then you shouldn’t be afraid to show my comment and being so you wrong you should easily be able to prove by Scripture how wrong I am.